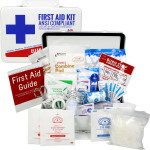 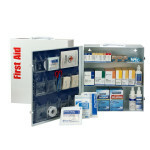 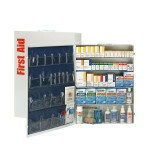 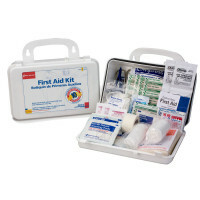 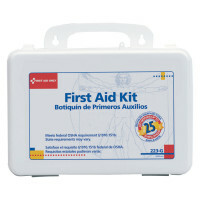 First Aid Kit for 50 persons with essential first aid items per ANSI z308.1-2009 specifications. 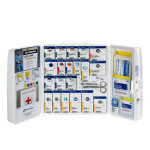 Contents are organized for fast access and labeled with clear directions by injury type. 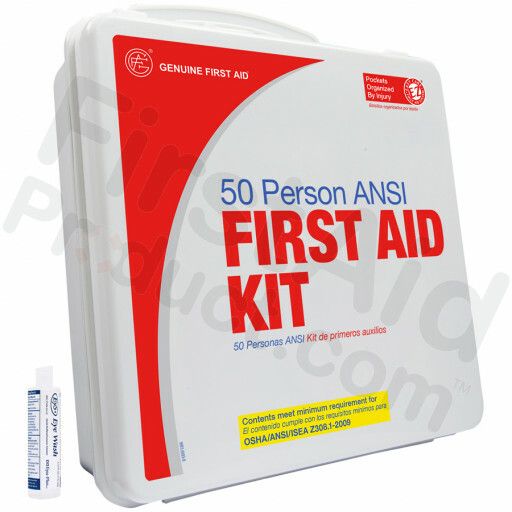 Contains concise directions for use. Refills available. 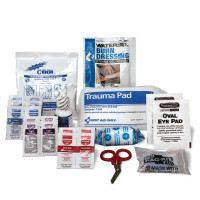 (2) *First Aid Tape Roll, 1/2" x 2.5 yds..
(4) *Sterile Gauze Pad, 3" x 3"
(1) *Trauma Pad, 5" x 9"
(1) *Triangular Bandage, 42" x 42" x 59"
(2) Roller Gauze Bandage, 2" x 4.1yds. 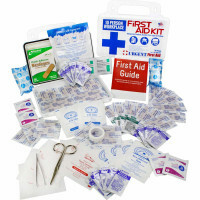 (1) Roller Gauze Bandage, 3" x 4.1yds. 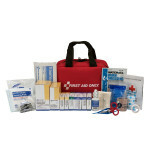 (4) Sterile Gauze Pad, 4" x 4"
(60) *Adhesive Plastic Bandage, 1" x 3"
(2) Elbow/Knee Adhesive Plastic Bandage, 2" x 3"
50 Person Basic First Aid Kit with Eye Wash - Plastic.